News: American firm SOM has unveiled plans to build Singapore's tallest tower as part of a mixed-use development in the Tanjong Pagar business district. 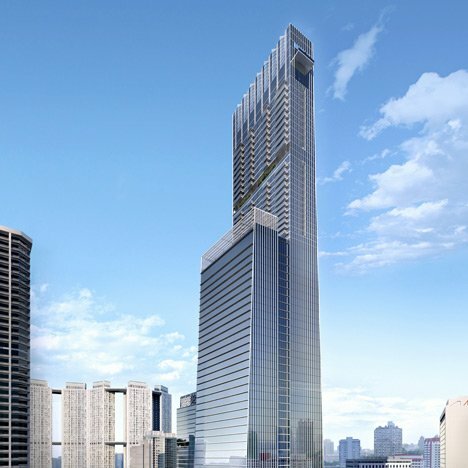 SOM's 64-storey, 290-metre tower will be positioned on the eastern part of the Tanjong Pagar Centre site, and will contain offices on its lower floors and luxury apartments above. A smaller tower alongside it will accommodate a business hotel with its own restaurants and conference centre as well as a pool overlooking the redesigned Tanjong Pagar City Park. An additional six-storey building will provide a car park, shops, restaurants and entertainment as well as an area for public art and outdoor performances. SOM is the architectural practice behind the tallest building in the world, the Burj Khalifa in Dubai. The firm recently proposed a floating observation deck over Grand Central Station in New York and a tower with triangular facets in Seoul – see all architecture by SOM. Elsewhere in Singapore,the Gardens by the Bay tropical garden was named World Building of the Year at last year's World Architecture Festival, where Dezeen filmed an interview with architect Chris Wilkinson about the project – see all architecture in Singapore. Images are by SOM and copyright Digital Mirage. Positioned as a premier quality business and lifestyle hub, the 1.7-million-gross-square-foot Tanjong Pagar Centre will provide a mix of uses, comprising office, residential, retail and hospitality, in Singapore's historic Tanjong Pagar central business district. The development will be a significant contribution to the evolving skyline of Singapore and will become a landmark destination, serving as a gateway to the future waterfront city. The centerpiece of the project will be a re-designed Tanjong Pagar City Park to create unique public spaces that provide activity and open space to visitors. In line with the Singapore's Urban Redevelopment Authority's mission to create lively and attractive public places, protected and useful outdoor gathering spaces and sustainable urban environments, Tanjong Pagar Centre will set the standard for sustainable, livable development in Singapore for generations to come. Located on the eastern half of the site, the mixed-use office and residential tower will feature Grade-A office space with luxury residential units above. This tower will be the tallest building in Singapore. The free-standing mid-rise tower to the west will accommodate the luxury business hotel and its amenities, including restaurants, a conference centre, gym and pool deck overlooking the Tanjong Pagar City Park. The six-storey podium will provide multiple levels of car parking, retail, restaurants, and entertainment, as well as the hotel, office, and residential lobby and amenities level. A large public component includes a "city room" which will feature public art and outdoor performance areas, ground-level retail, and an underground pedestrian network that will connect to the existing MRT station.